From an early period in Greek history, ornamented bands made from sheet gold were worn around the head. 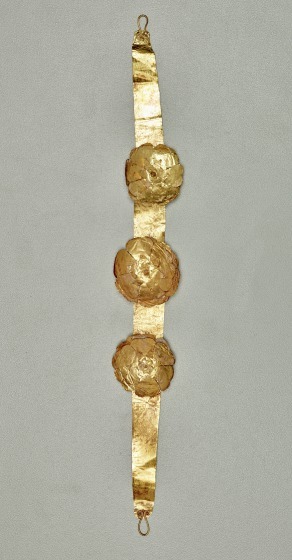 These diadems varied from simple gold or silver bands, to pieces with stamped and applied decorations. 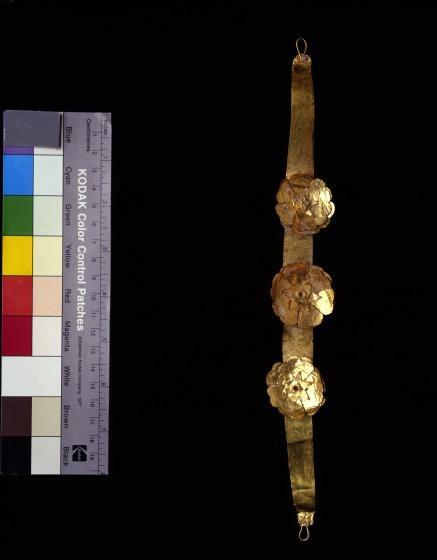 Three pieces in the collection of the Dallas Museum of Art illustrate the development of the Greek diadem from the Archaic to the Hellenistic periods: this Archaic gold band with separately made rosettes, a Classic Greek diadem with an ornamental frieze [1991.75.54], and an elaborate, three-dimensional diadem [1991.75.75] that embodies the Hellenistic style. 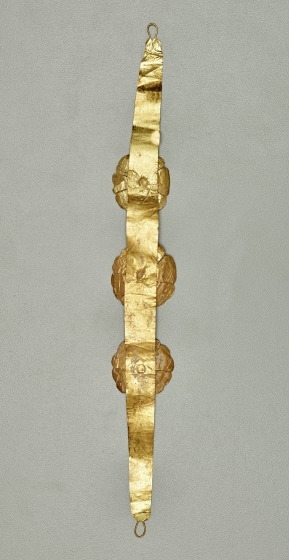 This diadem is made of a long fillet of sheet gold, slightly broadened in the center. Omega-shaped wire loops are attached to the front of the rounded ends, enabling the wearer to secure its position around the head. Three rosettes, each with a double layer of heart-shaped petals, are applied to the front of the fillet and held by a gold tube. In the center of each rosette is a considerably smaller rosette with pointed petals. Many similar diadems, made from thin sheet gold with applied or impressed adornment, have been found in Greek tombs beginning in the 6th century BCE and continuing through the Roman period (2nd century BCE). The diadems could have been worn in life at banquets, as victors' prizes in war or athletic competitions, or on religious or civic occasions, but their burial defined a different kind of triumph.